Our Davidson Wildcats play Marquette tomorrow in the second round of the NCAA Tourney in Lexington, Ky. A lot of thoughts and words have clumped themselves together in my head - along with nerves - and I'm not quite sure how to put them on paper just yet. 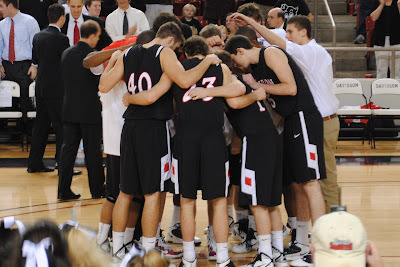 So for now, here are all the words I've written about this Davidson team over the last four years. It's been quite a journey through this post-Elite Eight era, full of tension and frustration and a beauty and grace all its own. I wouldn't ask for it to have gone down any other way. Over and over, through the cycles of forming and growing a team and building community, we see it come back to this peak of gratitude, pride and hope. I don't know if it happens quite the same any other place, this life-brimming small town where we root our hearts deep in the North Caroline dirt. I guess I did have a few words in me after all. And here are many more, from 2009 to now. Tomorrow let's enjoy the ride, just like we always have. Go 'Cats! October 16, 2010: Part Two: "Foster Community, Encourage Diversity & Find a White Lobster"
October 18, 2010: Part Three: "It Was Always Worth It"
January 20, 2011: Who Are We Going to Be? March 11, 2012: "Sanity Has Flown Out the Window, and Into the Night"